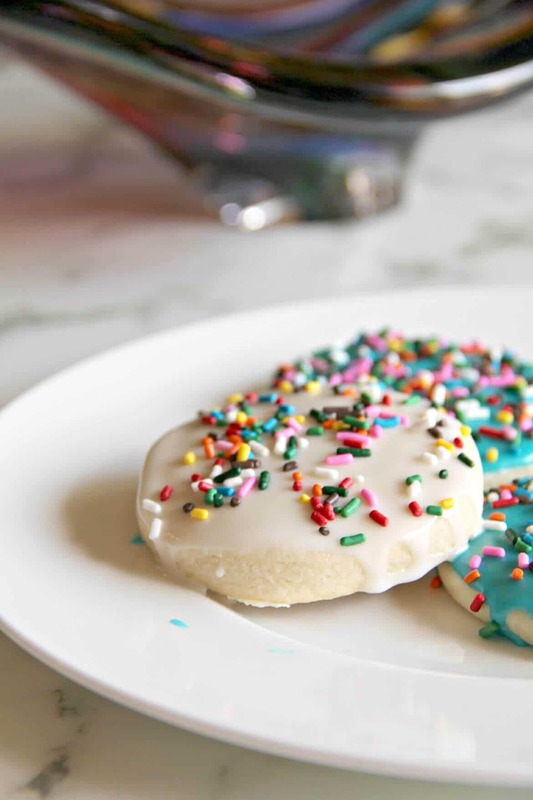 A delicious and easy sugar cookie recipe with simple icing that’s quick and easy to apply. And sprinkles, of course! Kids love these cookies. I love cookies. Chocolate Chip Cookies are probably my favorites. But so are Ginger Cookies. And I could eat an entire plate of Mexican Wedding Cookies. But isn’t there just something about sprinkles and sugar cookies that makes you smile? 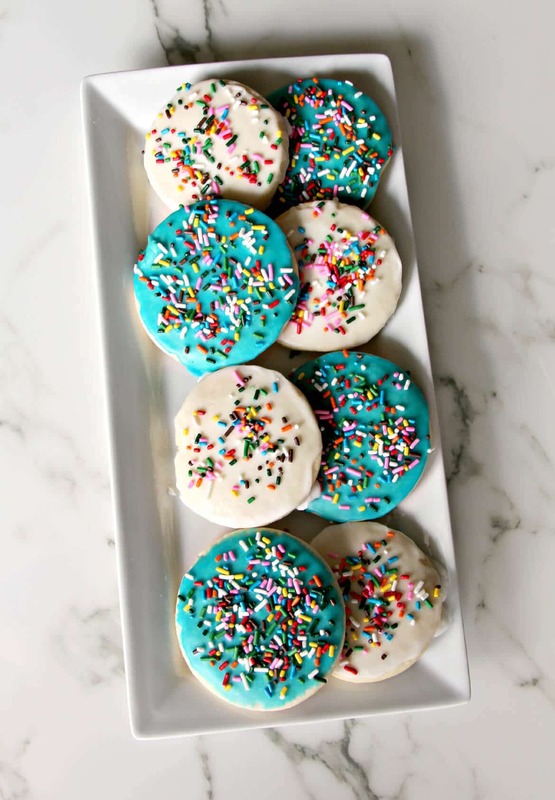 Sprinkles are cheery little rainbows atop sweet, soft cookies, just the right touch for a party or at the end of a long day. Some sugar cookie recipes are long and tedious, with loads of instructions and various icing techniques. And if I were making sugar cookies for a special event like a bridal shower and needed to make pretty shapes and colors I would use Royal Icing and bags and bowls and have lots of different colors. 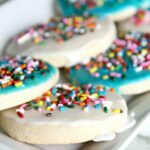 I love this sugar cookie recipe because it’s simple and quick and makes pretty, colorful cookies that are plenty special enough for almost any occasion. 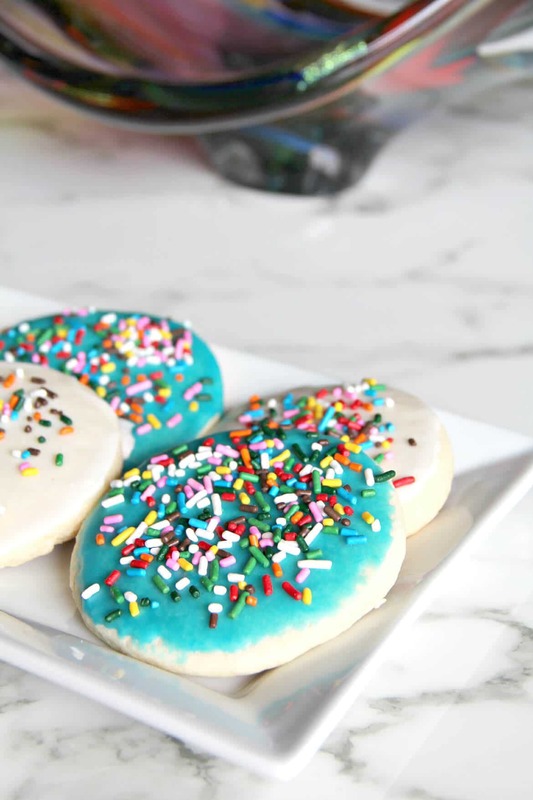 This simple sugar cookie recipe is different from my Funfetti Sugar Cookies, which are much softer in texture and filled with sprinkles all throughout. 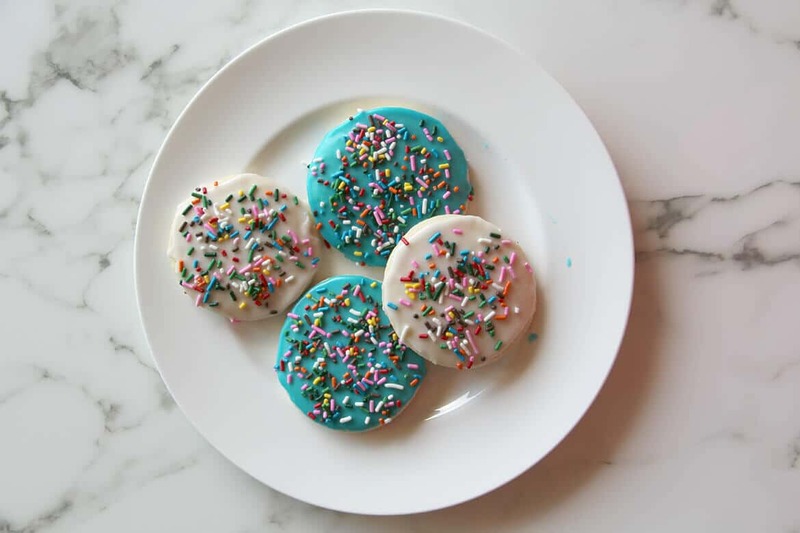 These sugar cookies are actually similar to my tea cakes—in fact, the recipe is pretty much the same except I usually end up with more flour in the tea cakes so they are slightly less sweet. This recipe makes perfect Christmas sugar cookies also, with red and green icing and Christmas sprinkles. What makes these sugar cookies special is the use of a simple icing rather than Royal Icing. I just add a little milk or half and half to powdered sugar, a touch of vanilla, and then whatever color I want. It’s really more of a glaze than a true icing, but it works just fine. And my secret to making easy sugar cookies: I use a sponge brush! Just grab the smallest sponge brush and dip it in the icing and paint the icing right on the cookie. Then add sprinkles and lots of smiles. 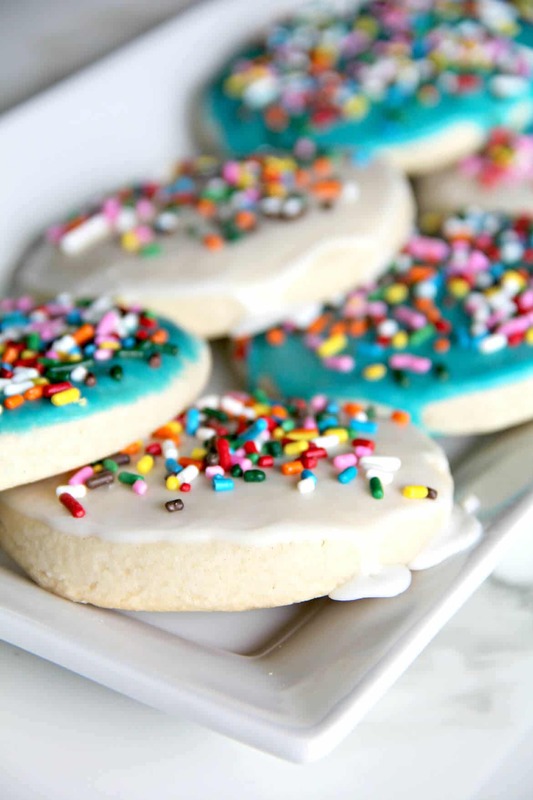 An easy sugar cookie recipe with a glaze icing that tastes good and is simple to apply. And sprinkles, of course! In medium bowl, whisk together the flour, salt, and baking powder. Set aside. In bowl of stand mixer, cream butter for about five minutes. Add sugar and beat on medium-high until light and fluffy. Scrape sides and bottom of bowl frequently. Add egg and egg yolk and beat about a minute. Add vanilla and almond extracts. Turn mixer down to low and gradually add flour mixture, beating until just combined. Divide dough into equal portions, wrap in plastic wrap, and refrigerate for at least thirty minutes or until needed, up to two days. When ready to bake cookies, preheat oven to 350. Line 2-3 baking sheets with parchment paper. Remove dough from refrigerator and allow to soften a bit. On a floured surface, roll dough to desired thickness, 1/4 inch to 1/2 inch. I like thick cookies so I use 1/2 inch. Place cookies on prepared baking sheet and bake 9-11 minutes, depending on thickness of dough. The cookies should not turn brown but be lightly colored at the edges. Don't overcook or cookies will be dry. Allow cookies to cool on baking sheet for five minutes, then transfer to a wire rack and cool completely before icing. Stir half-and-half or milk and vanilla or almond extract into powdered sugar until smooth with no lumps. Divide into small bowls if you want to make multiple colors and add drops of gel food coloring to achieve desired color. Using a small sponge brush, paint icing on cookies. I usually do one layer on a couple of cookies then go back and do another layer to give it a little thickness. Then add sprinkles and allow cookies to dry completely before storing. Cookies will keep 3-4 days, although I've never known anyone to keep them that long.